The Big Idea: A close connection between parents and caregivers helps children feel secure and enjoy themselves! Feeling comfortable and familiar with your child’s caregiver is so important for your peace of mind. So is knowing what kind of day your little one had. That will help you make sense of her behavior back at home (for instance, if she seems tired, you might want to know if she napped less than usual today). 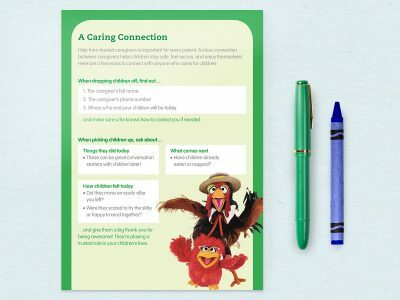 You can use these conversation starters to develop a closer connection with your child’s caregiver, and learn more about what your child was up to while you were away. Try to have a quick catch-up session when you pick up your child, or ask caregivers if they can send you a text or e-mail update about the day’s events.